Special thanks to Stila Cosmetics for sponsoring this conversation about some of our favorite products for fall. Links may be affiliate links. I am a huge fan of Stila Cosmetics. I use a lot of the line in my everyday makeup wearing life. While I’m not necessarily brand loyal in that “I only use XYZ brand,” there are a lot of products that I stick to. Why? Lots of reasons, but because they’re tried and true. And I know they’re going to work, and give me the look I’m going for. 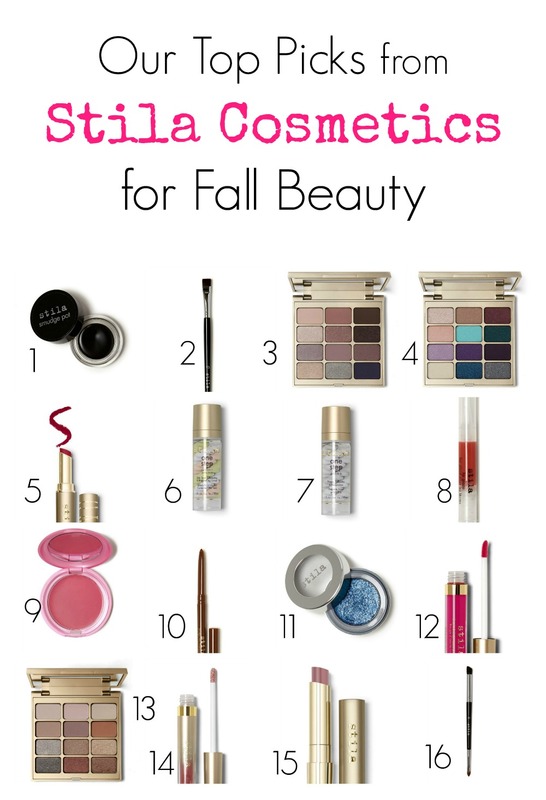 With summer starting to wind down, and autumn beginning, these are some of our top picks from Stila to transition your makeup from Summer to Fall. And beyond! 1 Stila Smudge Pot – If you like a gel eyeliner, this is one of the best. 2 One Step Eyeliner Brush – If you’re going to use a gel liner like the Smudge Pot, you need a good liner brush. I like this one. 3 Eyes are the Window Shadow Palette in Soul – Soooo…when I bought the Body palette, I decided “I reallllyyyyy should get some neutral colors into my makeup repertoire….” so I picked up Soul too. SO PRETTY! It’s not like, browns, it’s pinks and greys and a little bit of blue and silver. 4 Eyes are the Window Shadow Palette in Body – I am drawn to vivid colors of eye shadow. So, naturally, I picked this one up, and haven’t regretted it one bit. 5 Matte-ificent Lipstick – I love a matte lip. Most matte lipsticks are kind of drying, though. Not this one. Matte-ificient feels good on, and is easy, since it’s like a traditional lipstick. Shown in Bisou Red. 6 One Step Correct – This is a primer and color corrector in one. Great foundations starts with great skin, and this helps ya get there. 7 One Step Prime – If you already have good skin, and don’t need color correction, this is a great primer. 8 Stila Lip Glaze – We all still need lip gloss, right? Of course we do. Available in 26 amazing shades. 9 Convertible Color – This was a revolutionary product when it came out, and it still gets Best Of awards year after year. It’s a blush and lip color all in one. Shown in Sweet Pea. 10 Stila Smudge Stick – This waterproof eyeliner stays put, and doesn’t run or get away. But – it’s easy to remove! Smudge Sticks are available in tons of colors, and include matte and shimmer colors. Shown in Sienna. 11 Magnificent Metals Foil Eye Shadow – I am all about the sparkle, and these shadows are freaking amazing. Not gonna lie, sometimes, if I need a pick me up, I just swatch ’em on my hand and my day instantly improves. Shown in Metallic Cobalt. 13 Matte N Metal Eye Shadow Palette – Gorgeous neutrals in both metallics and mattes that work together so well. 14 Glitterati Lip Top Coat – Sometimes you want a matte lip, and sometimes you want some sparkle and shine. Get both with this top coat that’s designed to go over your matte liquid lip colors. 15 Stila Color Balm Lipstick – This is one of those products that works with everyone’s natural color. It gently shifts the color of your natural lips, so you always have a flattering lip color. It’s moisturizing, too. Like a lip balm. 16 Eye Enhancer Brush – Good brushes are the real secret to great makeup. This is one of my favorite brushes. It just makes your eye makeup easier to apply, and get right. 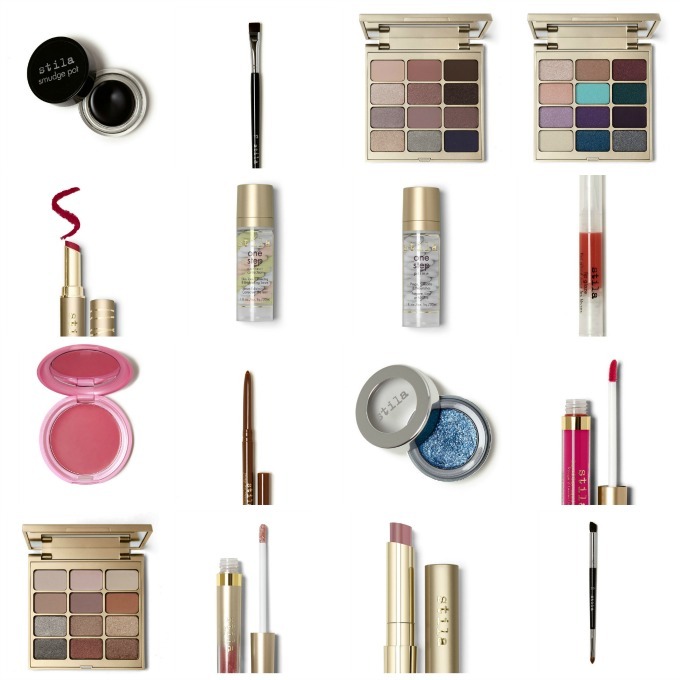 Do you have any favorites from Stila Cosmetics?